Oracle Autonomous Database is a cloud-based technology designed to automate many of the routine tasks required to manage Oracle databases, which Oracle says can free up database administrators (DBAs) to do higher-level and more strategic work. Introduced in 2017, the technology combines the company's Oracle Database 18c software with a set of automated administration services that use machine learning algorithms. Oracle 18c itself isn't autonomous -- the automation capabilities are provided by what Oracle has added on top of it to create Autonomous Database. The combination is offered as a cloud service called Oracle Autonomous Database Cloud, which Oracle describes as "self-driving, self-securing and self-repairing." Because of its machine learning functionality, Oracle Autonomous Database is able to assimilate the information that it needs to take care of itself. For example, the autonomous software provisions databases on its own, finding, allocating and configuring all of the necessary hardware and software for users. Oracle Autonomous Database also doesn't require manual tuning to optimize performance; the technology tunes itself, including automatic creation of database indexes to help improve application performance. It also automatically applies database updates and security patches, backs up databases and encrypts data to protect information against unauthorized access. The system patches itself on a regular quarterly schedule, although users can override this feature and reschedule the automatic patches if desired. Oracle Autonomous Database can also apply out-of-cycle security updates when necessary -- for example, if Oracle releases an emergency patch to address a zero-day exploit. Additionally, the technology uses Oracle's Database Vault tool to prevent Oracle DBAs from seeing user data and the company's data masking feature to identify and conceal sensitive data. Oracle Autonomous Database can scale itself up as needed; it also monitors capacity limits and bottlenecks in key system components in an effort to avoid performance problems. Updates are applied in a rolling fashion across a clustered system's compute nodes so applications can continue to run during the process, and Autonomous Database automatically repairs itself in the event of a system failure, according to Oracle, which guarantees 99.995% uptime on the cloud service. The technology gathers statistics as new data is uploaded, and regularly runs tests to ensure that all changes and upgrades are safe. It scans for issues across all layers of the technology stack using diagnostic tools such as ORAchk, EXAchk, OSWatcher and Procwatcher. If an error occurs, Autonomous Database collects relevant diagnostic data, analyzes logs to establish a timeline and works backward to solve the problem. For example, it can back out data errors made by users. Oracle Autonomous Database is likely to change the way that Oracle DBAs function in organizations that adopt the technology. Because many of the more mundane tasks that DBAs now handle will be automated, Oracle says they'll be able to focus on things like data security, data lifecycle management, data architecture and data modeling. Additionally, DBAs could gain more time to work on new projects and help both development teams and end users to take better advantage of Oracle databases. From an organizational standpoint, using Autonomous Database could reduce the need for human labor on Oracle data management teams, although Oracle says it expects the autonomous software to alter DBA jobs instead of eliminating them outright in most cases. The technology could also minimize data loss and human error in Oracle databases, while cutting back substantially on both planned and unplanned downtime. Oracle Autonomous Database runs on the company's Exadata hardware platform and can be used either in the Oracle Cloud or via Cloud at Customer, a service that deploys systems based on Oracle's cloud technologies in on-premises data centers. 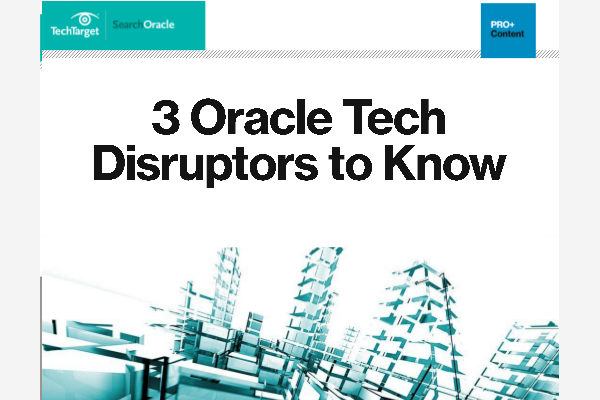 Oracle is developing multiple product offerings as part of the Oracle Autonomous Database Cloud service. The first was a data warehouse implementation that supports business intelligence and analytics uses; called Oracle Autonomous Data Warehouse Cloud, it was released to a group of early users in late 2017 and became generally available in March 2018. Other versions will follow for transaction processing workloads and NoSQL databases, according to Oracle.